The iLIFT Suspension Lift System is a revolutionary product for intelligently lifting a vehicle to avoid damage from contact with obstacles including speed bumps and steep driveways. What makes the iLIFT system ``intelligent``? The iLIFT Suspension Lift System incorporates an intelligent Electronic Control Unit (ECU) and sensors to monitor various parameters such as ground clearance, vehicle speed, and system air pressures. The iLIFT Suspension Lift System intelligently adapts to your vehicle and the way you drive. How else is the iLIFT system different? Compared to ``air bags`` the iLIFT suspension does not affect performance during normal driving. The iLIFT actuator is solidly affixed to the suspension and doesn't require the vehicle to ``ride on air`` as with a conventional airbag system. Patented use of factory cruise control switches with the intelligent ECU allows most vehicle applications to use factory cruise control switches for manual activation of the iLIFT system to raise and lower the vehicle eliminating the need to add aftermarket switches. The iLIFT Suspension Lift System has been awarded twelve patents for innovative features include sensing and activation technology and designs that offer superior performance and compact components. The iLIFT Suspension Lift System is engineered for superior performance and durability. Specially designed actuators with patented seal technologies reduce road debris contamination. Using high quality, OEM-grade components, including the supplied German-made compressor, results in superior durability compared to the competition. You may have seen competitor systems with big air tanks that take up trunk space. The iLIFT Suspension Lift System is able to use compact reservoirs that are a third or smaller in size and provide significantly faster lift speeds. The iLIFT Suspension Lift System is designed for easy installation and setup. Using your Android or Apple device - easily setup and monitor the iLIFT Suspension Lift System in minutes. Sophisticated Electronic Control Unit constantly monitors system parameters including system pressures. Environmentally sealed enclosure means the ECU can be mounted in or outside the cabin. Setup and configuration of the iLIFT Suspension Lift System is accomplished wirelessly with an Android or Apple mobile device. Patented system allows use of factory cruise control switches to operate the iLIFT System for most vehicles. 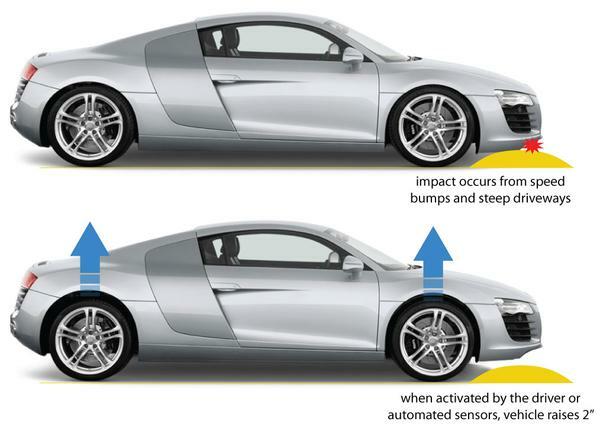 Optional patented use of sensors allow automated vehicle lift when an obstacle is detected. Proprietary pneumatic valves and seals allow the vehicle to raise in 1-2 seconds. Patented actuator and ECU-controlled valve technology means the iLIFT Suspension Lift System is the most compact system available.